Deputy Attorney General Rod Rosenstein was joking when he discussed wearing a wire to secretly record President Donald Trump and does not believe Trump should be removed from office through the use of procedures outlined in the Constitution's 25th Amendment, according to sources familiar with his conversations. 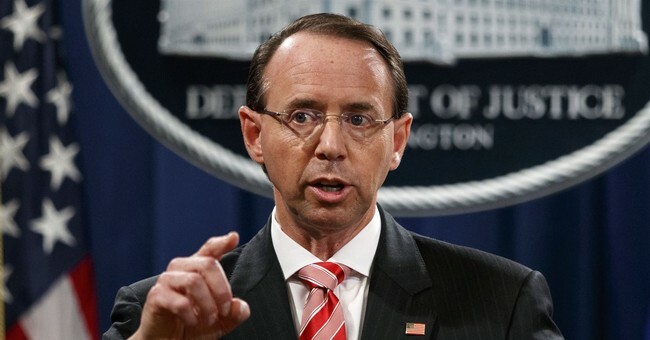 The sources were responding to a New York Times report that Rosenstein, in the tumultuous spring of 2017, had discussed with other Justice and FBI officials the possibility of recruiting members of Trump's Cabinet to declare him unfit for the job and that he offered to wear a recording device during conversations with the president. Well, what do you want me to do, Andy, wear a wire?" Rosenstein asked at the meeting, which also included FBI lawyer Lisa Page and four career DOJ officials, according to the senior official. One of the career civil servants was Scott Schools, who would later go on to sign off on the firing of McCabe, the official said. This official and a source who was in the room characterized Rosenstein's remark as sarcastic. It’s anonymous sources tag. It’s absurd. The whole story is just too good to be true. As Cortney noted, Mr. Rosenstein has already said the Times story was inaccurate. There are moments, where anonymous sources have led to great journalism and blown open huge stories, like Nixon and Watergate. In general, I’m not against this avenue when it comes to obtaining information for stories, butthe use of anonymous sources has ended disastrously—and it’s not just for Trump White House pieces. When the San Bernardino terror attack happened three years ago, The Timesstepped on a rake when it reported that the government had missed social media posts from one of the attackers, Tashfeen Malik. The other dealt with the Clinton and her email fiasco. The paper’s public editor, who is no longer there, highlighted both trip ups. In fact, the Times reportedly had sought to tighten the screws on such sources after these errors. It’s a wait-and-see game with this drama, which will likely turn out to be nothing. With the media’s serial failure to report on this administration accurately, and the list is extensive, get back to your normal day folks. The seriousness of this story was dropped several levels in the span of a couple hours.